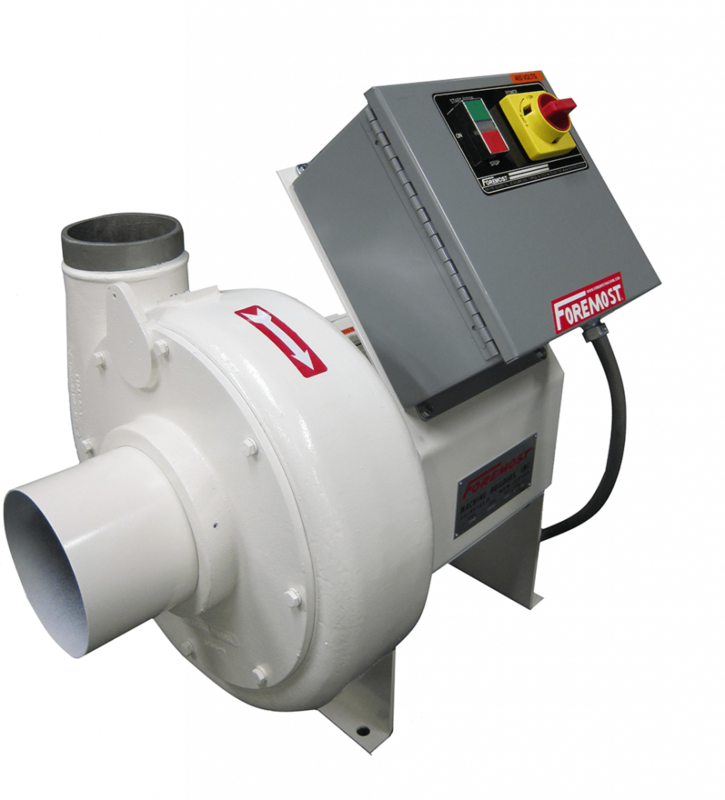 Direct Drive Impellers and Blowers – Foremost Machine Builders, Inc.
Foremost has a complete line of direct drive impellers and blowers that are designed to provide rapid, automatic unloading of all plastic raw materials in pellet or granular (regrind) form. The direct drive designs operate at lower RPM’s than belt drive units, resulting in considerably lower sound levels. Yet conveying rates are equal to, or better than, comparably horse powered belt drive machines. The simplified design requires much less routine maintenance and, with fewer components, assures trouble-free operation and long life. These units can be supplied with material pick-up “suction lances”. They are ideal for emptying bulk cartons and drums, feeding storage bins, loading machine hoppers, and other in-plant conveying applications. They are easily portable and are designed for continuous operation. In other applications, and with all other units, a chute or similar device is required to direct material into the inlet of the blower or impeller. They are commonly used to unload grinders, granulators, blenders, and material storage tanks. Under normal circumstances, a cyclonic air separator is required at the material receiving location. Combination motor starter with through the door disconnect. All mounted on a rigid base. Supplied as an integral part of grinder or blender.